Apple's annual back to school promotion for college bound Mac buyers begins tomorrow, offering a $100 iTunes Store gift card rather than bundling a free iPod as it has in previous years. The new promotion, as it appears in marketing materials depicted by MacRumors (pictured below), notes the deal begins June 16 and runs through September 20. 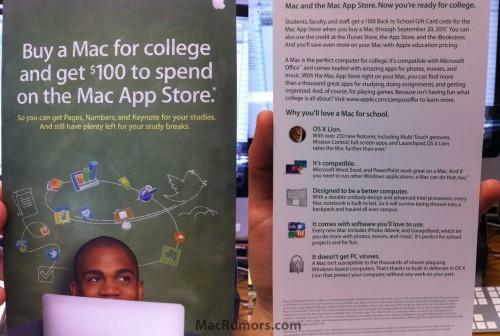 While the deal highlights "$100 to to spend on the Mac App Store," ostensibly "so you can get Pages, Numbers and Keynote for your studies. And still have plenty left for your study breaks," the fine print details that the credit is redeemable for any iTunes content, including the iOS App Store, iBooks, Mac App Store, and iTunes movies and music. This year, Apple will add Mac OS X Lion and Final Cut Pro X to its Mac App Store software offerings, which currently include Aperture, iWork apps and iLife apps (although the latter are currently bundled on new machines at no cost).